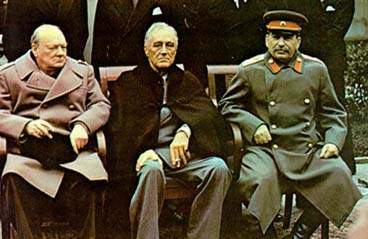 In the closing months of World War II, the leaders of England, the United States, and Russia, pictured above, met in Yalta, the Russian seaport on the Black Sea. The three men had united their countries’ armies to fight Hitler, Mussolini, and the Japanese. Fighting took place all over the globe, millions of lives were lost during the 1940s. This photo of the three leaders became immediately famous as a symbolic image of the promises they made for their countries to rebuild Europe after the victory over Germany. U.S. National Archives, 1945 Photograph from the Army Signal Corps Collection in the U.S. National Archives. Photo #: USA C-543.